Tec-Masters, Inc. (TMI), has won the Joint Conflict And Training Simulation (JCATS) Constructive Simulations and Gaming Operators Contract supporting the Mission Simulations Center (MSC) at Fort Sill OK.
HUNTSVILLE, Ala. - July 2, 2013 - PRLog -- Huntsville, Alabama: July 2, 2013 – Tec-Masters, Inc. (TMI), headquartered in Huntsville, Alabama has won the Joint Conflict And Training Simulation (JCATS) Constructive Simulations and Gaming Operators Contract supporting the Mission Simulations Center (MSC) at Fort Sill OK. This is yet another example of TMI’s dedication to the simulations arena supporting the military. Military Training Technology (http://www.kmimediagroup.com/military-training-technology/) has named TMI a Top Simulation and Training Company for the last three (3) consecutive years. The MSC is a multi-echelon, multi-environment training facility that supports collective and classroom training regardless of the level of training echelon required. This training includes initial, refresher, delta training, and even exercise events. The facility and its staff employ multi-functional, embedded capability and subject matter expertise to provide seamless training, mission rehearsal, operational mission support, and execution. The MSC links Live, Virtual, Constructive, and Gaming training into an Integrated Training Environment (ITE). TMI personnel assigned to this Task Order will provide the Subject Matter Experts (SMEs) to enhance the training capabilities for all units at the U.S. Army Fires Center of Excellence (FCoE), Fort Sill, Oklahoma, as directed. · Site Lead, Mr. Thomas Parkinson. · Exercise Planner, Mr. Dave Swatsky. · JCATS Database Manager, Ms. Sonya Schadler. · Computer Systems Manager, Mr. John Dyer. · Fire Sim XXI Database Manager, Mr. Timothy Horvath. · VBS2 Database Manager, Ms. Mary Claytor. · MUSE META-VR Database Manager, Mr. Miguel Aponte. These personnel will assist the Army with developing and fielding Live, Virtual, Constructive, and Gaming Systems for echelons from company through theater level. Collective and classroom training is used to support initial, refresher, and delta training and support for exercises. All Army Battle Command Systems (ABCS) will ultimately be modeled so that ABCS specific training and total ABCS can be trained at the operator level in a computer based environment, simulated in a synthetic theater of war and used for exercises and mission rehearsals. 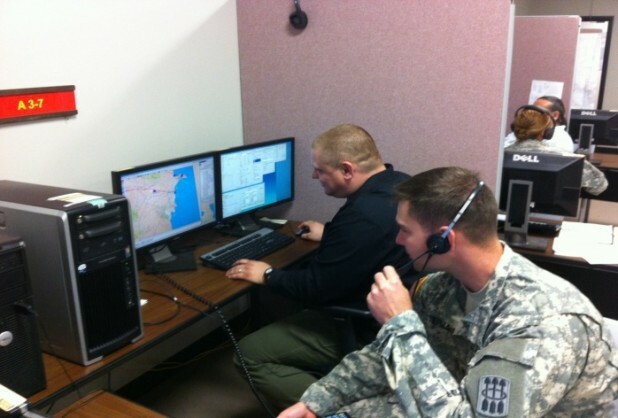 The team is currently providing training support for the Air and Missile Defense community. Students assigned to the Air Defense Captain Careers Course are run through a series of training scenarios referred to as an Air and Missile Defense Exercise (AMDEX). This exercise is designed to immerse the student in a simulated environment, providing them the opportunity to perform the Mission Command staff tasks of the 13th Air Defense Artillery Brigade and its subordinate battalions. · Deploy AMD Command and Control (C2) assets within the operational area. · Coordinate and provide AMD protection coverage of critical assets in accordance with the Commander’s guidance. · Rapidly adapt PATRIOT Engagement Operations based on METT-TC. · Conduct Force Protection Operations to defend against SOF or insurgent operations and integration into Base Defense Plans with collocated units. · Plan and coordinate air, sea, and other transportation required to execute the mission. · Plan and coordinate a Communication Plan that enables friendly protection, fire control, and command of subordinate/OPCON units. · Plan and coordinate Support/Sustainment Operations. · Develop and provide a Communications Plan to ensure continuous communications are maintained throughout the area of operations. · Establish early detection and warning of HARPY operations. · Deploy ADAFCO teams to controlling authority in accordance with commander’s guidance. Tec-Masters, Inc. has successfully worked in the Defense Industry since 1988, providing innovative technical solutions for Defense, Federal and Commercial customers worldwide. We specialize in Mission Support, System Integration, Maintenance, Training, Creative Multimedia Production, Logistics, Information Technology, Software Development and Customized Engineering & Manufacturing.